Anachronistically beautiful, Halcyon House, Cabarita Beach. Cabarita Beach on the New South Wales north coast perfectly embodies the word ‘halcyon’. A bastion of idyllic seaside charm, it’s the kind of place where, as you pass through, usually on your way to Byron Bay some 40 minutes down the road (or back again to the Gold Coast Airport in the other direction) you instantly recall carefree childhood holidays spent in any number of seaside towns exactly like this dotted on the edges of our island home. You can almost feel the sand between your toes, taste the tang of salt on your lips. 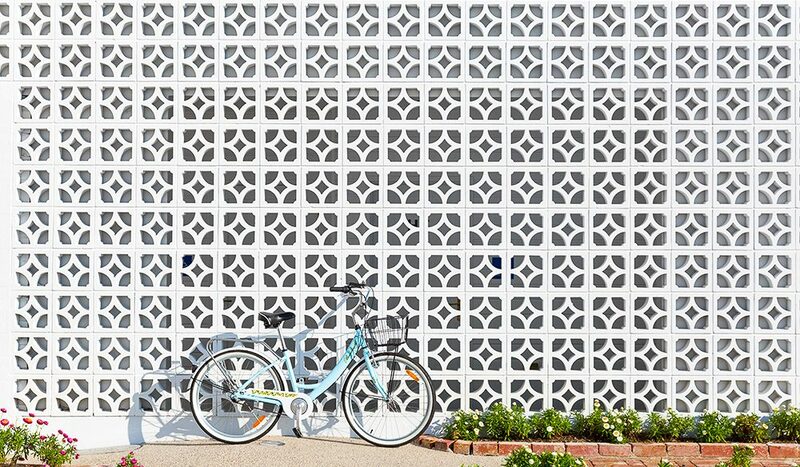 It is exactly this haze of nostalgia that attracted the Bickle sisters, Siobhan and Elisha, to Cabarita Beach and, specifically, to The Hideaway motel, a low-slung 1960s edifice of arches and Besser Blocks located a lazy amble from the beach. They purchased the motel in December 2011 intending to use it as a holiday house for family getaways; they have a total of nine children and a husband each between them. Set back from the main road and flanked by residential houses, some architect-designed, some delightfully ramshackled, The Hideaway was still being run as a going concern, so the sisters decided to keep it ticking along while they worked out what to do with it. Given that Siobhan and Elisha come from a successful Brisbane-based real estate and hospitality family this was not such a push, although this was to be their first full-blown hotel project. They appointed an architect to add another storey to the property, complete with lofty high ceilings, and reposition the public areas towards the sea. The arches and Besser Blocks – ubiquitous architectural elements in the day – remained. While the resulting faÇade definitely sets the tone of the place – at once totally nostalgic and pleasingly contemporary – it is what the sisters have achieved within that sets the property, now fittingly named Halcyon House, apart from anything else in the area, maybe even in the country. “We didn’t really think that anyone else was offering something different,” says Elisha. So that’s what they set about delivering, and tracking their progress along the way on Instagram. Working with designer Anna Spiro (her destination Black & Spiro storefront in Brisbane’s New Farm is a Mecca for design lovers, while her gorgeous blog Absolutely Beautiful Things resulted in an equally gorgeous book of the same name), the interiors are a riot of colour and texture and delightfully quirky elements. 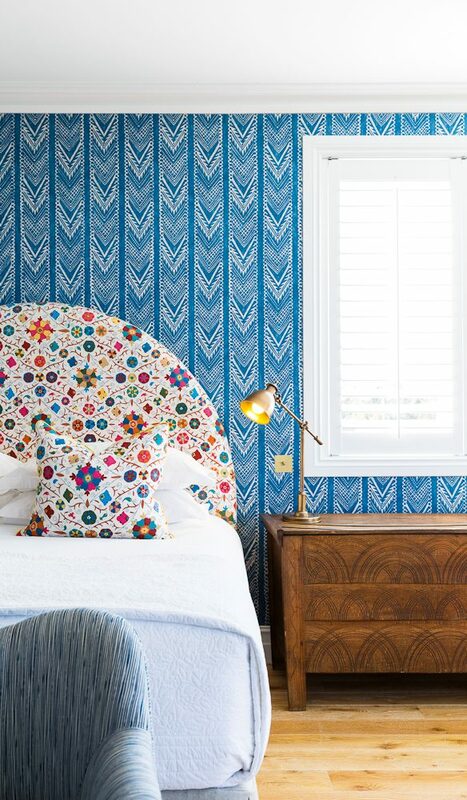 Each of the 21 rooms and two suites is decorated in its own individual style, from fabric wall panels in myriad prints (specialised craftsmen travelled from England to hang them as it had never been done in Australia before) to bespoke bed heads to meticulously curated clusters of art, from small canvases of floral still-lifes and seascapes to organic black-and-white prints by American artist Wayne Pate, which have become known as Halcyon Hangs. Much of the furniture is vintage, from substantial dark wood sideboards to tables with quaint turned legs, married with pretty little sofas and slipper chairs upholstered in yet more fabric. Siobhan and Elisha accompanied Spiro on trips to hunt out many of the pieces in the rooms, including to the fabled thrice-yearly Brimfield Antique Show in Massachusetts. “It’s not exactly an economical exercise, but it was fun,” laugh the sisters. 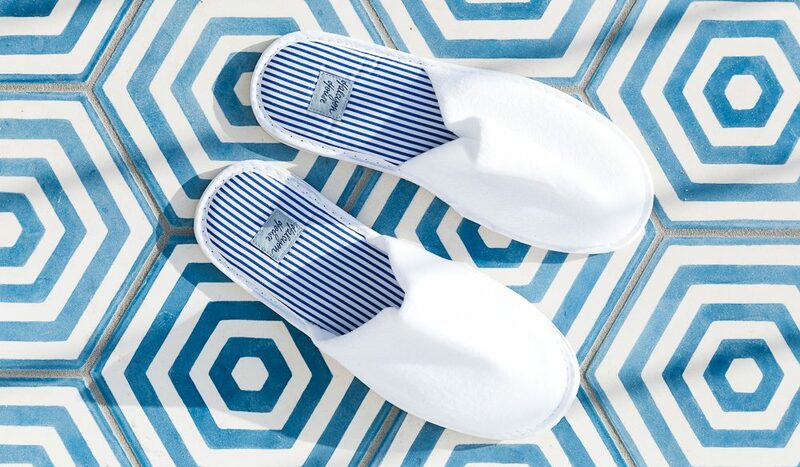 In the bathrooms and on the balconies that look out towards the water, exuberant blue and white tiles in geometric designs are underfoot, while details such as light switches also get the treatment: they are part of a brass theme that continues throughout the property. The aesthetic reaches an exquisite crescendo in the restaurant, Paper Daisy, named after the flowers that bloom on the nearby headland and which are scattered in terracotta pots and garden beds around the property. With its doors thrown open to the light and sea breeze, the space has an unfussy, beachy vibe. Diners can sit outside overlooking the pool on one side, with its deep, striped day beds, or on the lush grass and pandanus-dotted strip that melts into sand and sea just beyond the property’s low walls where locals stroll by walking their dogs or toting surfboards (guests and visitors can come and go through unlocked gates). 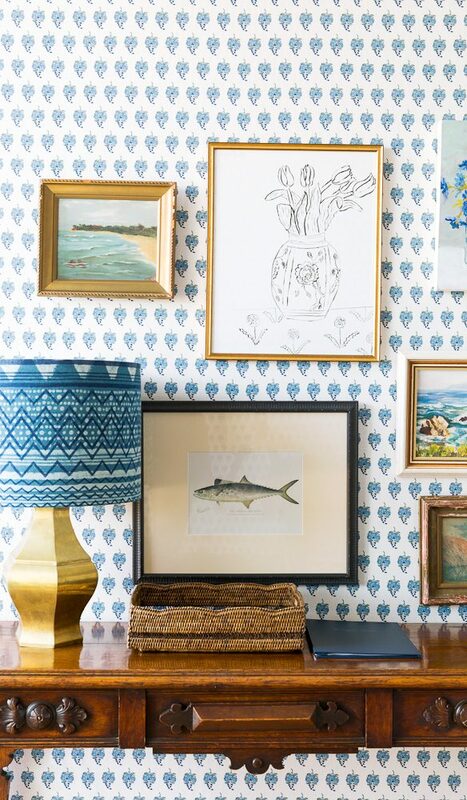 Inside, there is a blue and white theme, with overstuffed sofas anchored around a wide, low coffee table stacked high with design books and baskets filled with shells. Above all this loveliness is a statement light fitting of brass palm fronds. Sitting here you can look out over the room, with its blue and white French cafe-style chairs, eclectic mix of tables, and more Halcyon Hangs of vintage Willow-patterned plates, seascapes and portraits of anonymous women. The kitchen of Paper Daisy is the domain of award-winning chef Ben Devlin, who spent time at Noma before taking up residency at Halcyon House. His menus (breakfast is for guests only, while lunch and dinner is available to non-guests) are uncomplicated yet sophisticated, elevating the locally sourced produce he uses in dishes, such as fresh ricotta with raw and preserved vegetables and the signature prawn sandwich on sweet brioche with lashings of homemade mayonnaise. 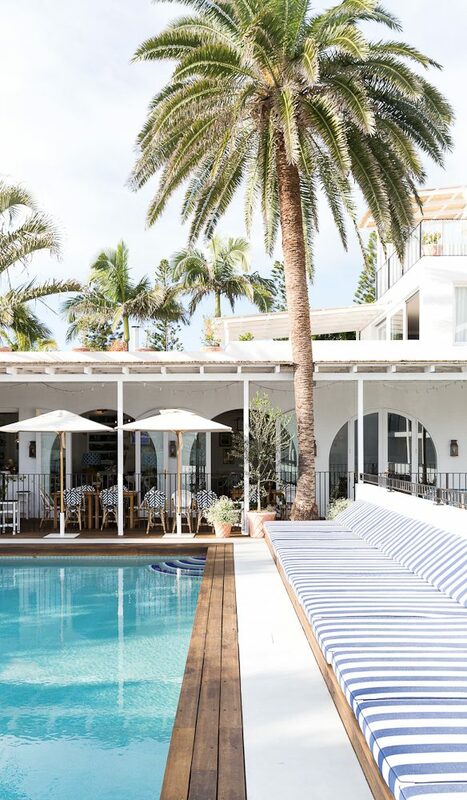 As you sit in the sun enjoying the fare, smiling staff buzz about taking care of the finer details: tilting the handlebars of the property’s fleet of sky blue bikes just so or delivering homemade cookies and handwritten notes to rooms. 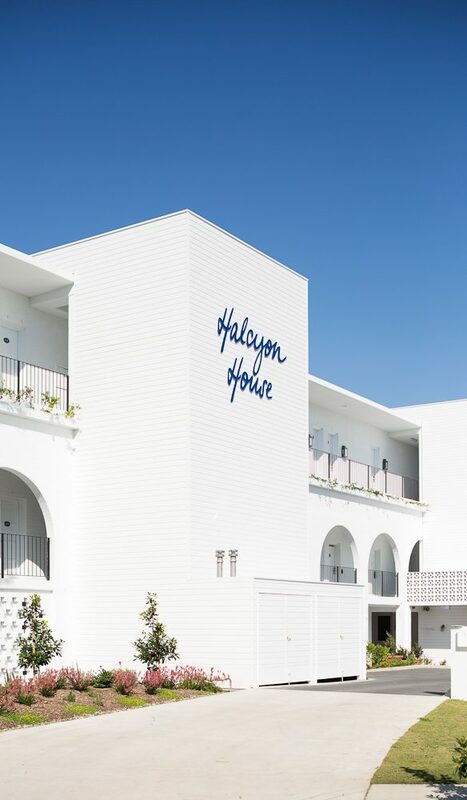 This attention to detail, which complements the aesthetic of Halcyon House, has been instigated by its manager Mauro De Riso, a native Italian transplanted to Cabarita Beach. 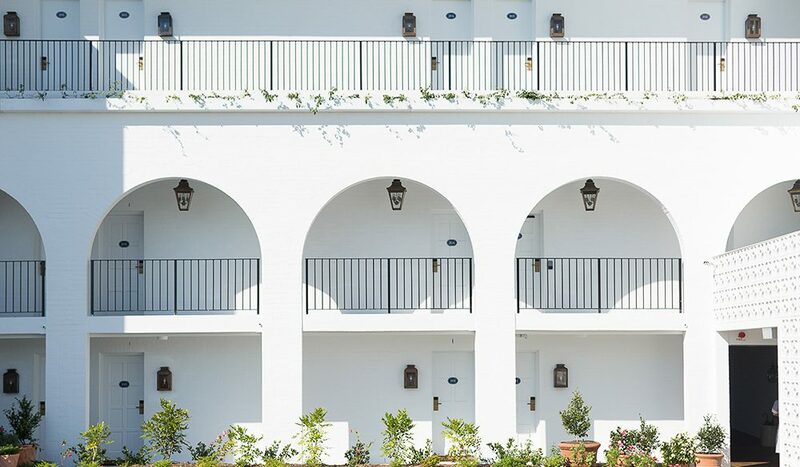 It is no coincidence that Halcyon House has much in common with the lauded J.K. Place hotel in Capri, where De Riso previously worked: Siobhan and her husband Adam stayed there when attending a friend’s wedding and loved everything about it. While the presence of De Riso and the trusted staff he has also lured to Cabarita Beach add a certain flair to Halcyon House, it remains a resolutely Australian proposition, with its focus on sun, sand and surf above all else. Blissfully, there is very little to do in Cabarita Beach apart from be outside, walking to the top of the headlands to spot whales, laying on the wide beaches watching local kids wade out of the surf from spear fishing expeditions, immersing yourself in the clear blue-green waters, returning to the property with sand between your toes and the tang of salt on your lips. “This was a risk – Cabarita is Cabarita, not Byron,” explains Elisha. “But we believe in the area, we believe in what is happening in the area.” It seems Cabarita Beach has more halcyon days to come. 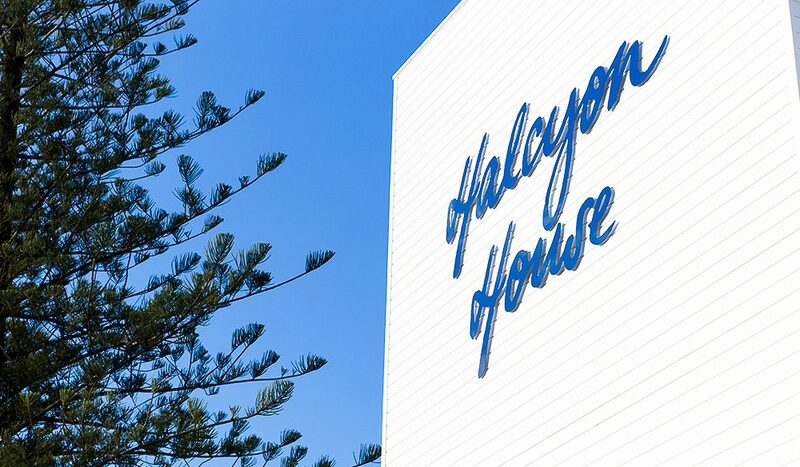 Getting there: Halcyon House is perched on Cabarita Beach, an hour’s drive from Brisbane and just 15 minutes or so from Gold Coast Airport, which Qantas, Jetstar and Virgin Australia fly to daily. Coming from the other direction, it’s a half-hour drive north of Byron Bay. Staying there: Accommodation ranges from the Classic Room (from $550 a night) to the Halcyon Suite (at $1400 a night). All have Halcyon House’s unique interior design.